Thanksgiving has always been my favourite holiday. In fact, I love it so much that I often celebrate it twice a year! I grew up in Canada, but my Father is an American and I also married an American (born and bred in North Carolina)…so really I am part Canadian and part American. Canada celebrates Thanksgiving much earlier than their neighbours to the south (in October) and American Thanksgiving always takes place on the fourth Thursday of November. This gives me a good month and a half in between Canadian and American Thanksgiving…plenty of time to reignite those cravings for stuffing, sweet potato casserole, green bean casserole, and of course pumpkin pie! Holidays can be challenging for many people who have dietary restrictions due to food allergies and intolerances, health preferences, medical conditions, or for those who are trying to lose weight. Especially for this latter group, holidays can be one of those times that can make or break your weight loss efforts. 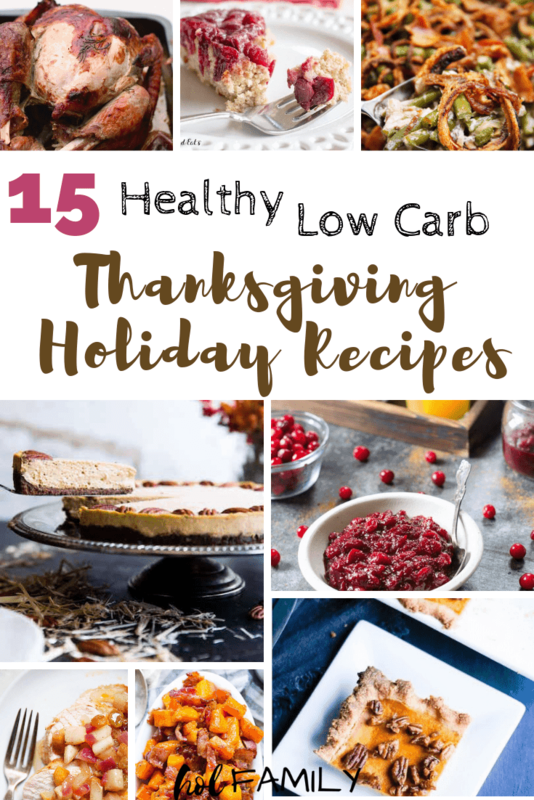 Whether you are hosting your holiday dinner and need recipe ideas for the entire meal, or are planning on bringing just a dish or two to another gathering with friends and family…these healthy low carb Thanksgiving holiday recipes will ensure that you don’t miss out on any of your favourite dishes! Low in carbs, but high in flavour, all of the dishes featured in this recipe round-up are gluten free, grain free, paleo, keto, and best of all…healthy and delicious. Stuffing has got to be my absolute favourite holiday dish! 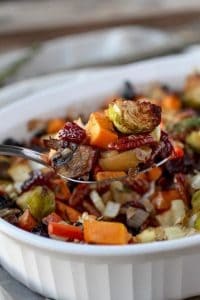 I’m a carb loving gal who eats a low carb Paleo diet, so finding a low carb/grain free replacement for stuffing is always at the top of my holiday meal planning list. This recipe actually did the trick for my taste buds! I hardly noticed the lack of bread thanks to the traditional spices and crunch of roasted cauliflower. My kids were even begging for seconds on this one! Click here to try this recipe by Maya at Wholesome Yum! Yet another stuffing recipe, because clearly I can’t get enough of delicious stuffing recipes! My mouth is watering just writing this post. 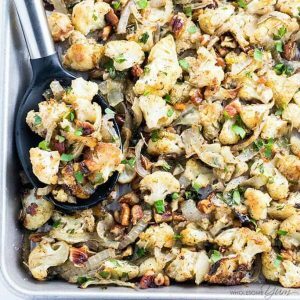 This version isn’t as low carb as the cauliflower stuffing recipe above, but it is still paleo, whole 30, grain free, and vegan friendly. This recipe substitutes the traditional bread found in most stuffings with vegetables like sweet potato and brussel sprouts, two of my all time favs! With some crunchy nuts, sweet fruit, and savoury spices, this recipe has a little bit of everything…sure to satisfy any palate! Click here to try this recipe by Staci at The Real Food Dieticians! I have to admit, I have never really been a huge fan of mashed potatoes…except at Thanksgiving. On their own, I find mashed potatoes a little bland and boring. Add the rest of the Thanksgiving mush, pour some gravy on top…and we are good to go! Anyone following a low carb, paleo or keto diet has probably tried mashed cauliflower. The challenge can be how to add creaminess and flavour without any dairy. This recipe really hits a home run on both accounts! The buttery taste is so real that you may not even want to pour any gravy on this mashed cauliflower. 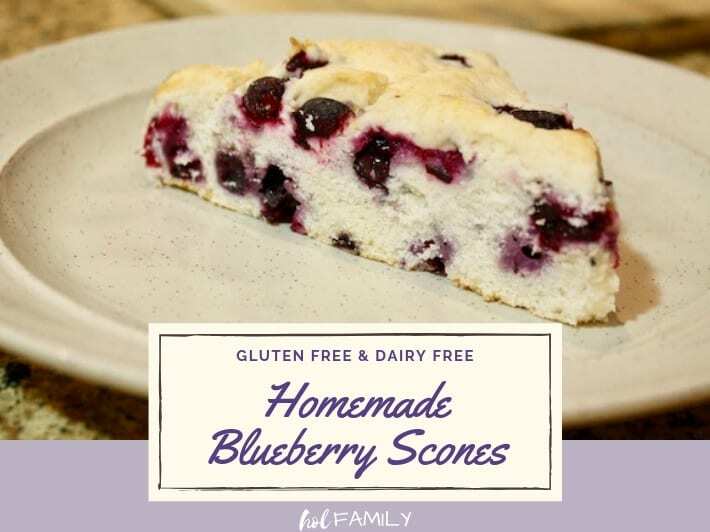 Click here to try this recipe by Taryn at Joy Filled Eats! 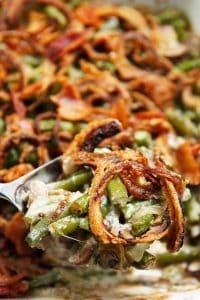 Green bean casserole is a traditional southern staple at any Thanksgiving table. Typically, this dish calls for cream-based canned soup and deep-fried onions. Not the healthiest dish but super tasty. Luckily, this lightened up version is completely dairy free, gluten free, and uses healthier avocado oil for making homemade fried onions. This creamy dish with a crunchy topping is definitely a must at your holiday meal! Click here to try this recipe by Lexi at Lexi’s Clean Kitchen! 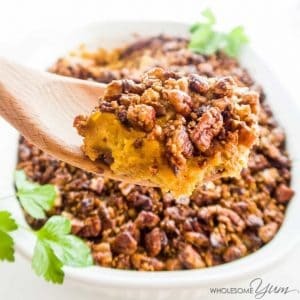 I know I already said that stuffing is my all time fav holiday dish, but sweet potato casserole comes in at a close second. Growing up, we had the southern version topped with ooey gooey marshmallows. Definitely NOT low carb! 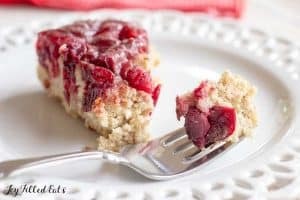 This healthier version uses just 8 ingredients and is keto/paleo friendly, low carb, grain free, and simply delicious. Don’t let the name fool you either, this sweet potato casserole actually has no sweet potatoes in it at all! 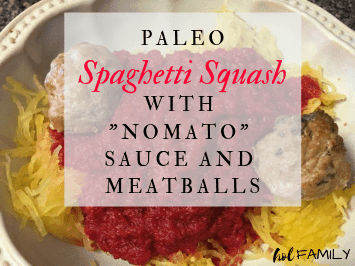 Instead, butternut squash is used to keep this dish low in carbs (although you could easily use sweet potatoes if you are not following a low carb diet). Finding healthy and grain-free side dishes for a holiday meal can be tricky. 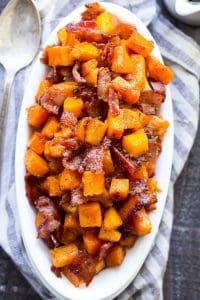 This recipe calls for roasted butternut squash mixed with bacon, maple syrup, and cinnamon, making the perfect combination of sweet and salty flavours. Butternut squash is lower in carbs than sweet potato, making this the perfect healthy alternative to dishes like sweet potato casserole. The addition of bacon adds an aroma and crunch to this recipe that will have everyone fighting over the last bite! 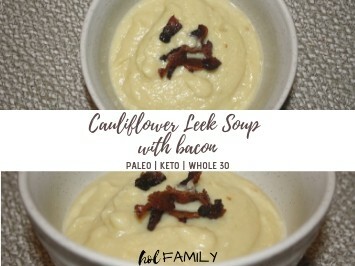 Click here to try this recipe by Michele at Paleo Running Mama! Scalloped potatoes are another favourite side dish for many holiday meals. 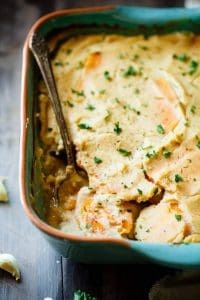 For those of us who avoid dairy, these cauliflower alfredo vegan scalloped sweet potatoes are a dream come true! With a creamy texture and just the right amount of sweetness (thanks to the sweet potatoes), this dish is one of my new favs! Cream based potato dishes are often loaded with calories, but this paleo, Whole 30, and vegan recipe comes in under 200 calories per serving! Click here to try this recipe by Taylor at Food Faith Fitness! Move on over turkey…this yummy orange glazed ham may just gobble you up! Not everyone loves turkey, or maybe you are like me and find yourself eating more than one Thanksgiving or holiday meal back to back. Be wary, not all hams are created equal. You’ll want to find a no-sugar, uncured ham like the one used to create this delicious spiral ham with absolutely no sugar glaze, 7-up, or syrups. 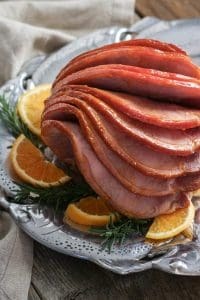 Using just orange juice, ginger, and cloves…this is one healthy ham recipe you’ll be raving about for weeks! Click here to try this recipe by Jessica at The Real Food Dieticians! Turkey is definitely always on the table at our Thanksgiving meals, but sometimes it is nice to have an alternative to cranberry sauce and gravy. This recipe is so versatile that you may just find yourself adding it to your monthly menu! 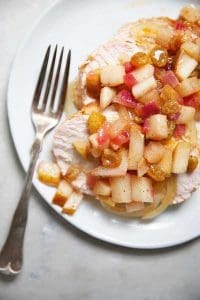 You’ll absolutely love the moist, tender turkey breast coupled with the fall spices in this delicious pear chutney! Kid-friendly, grain-free, paleo friendly, and absolutely astounding! Sometimes, you just want familiarity and comfort. 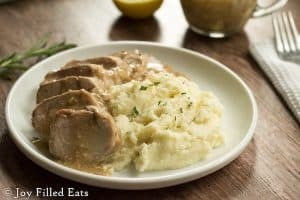 That is what this easy low carb roasted turkey with gluten free gravy delivers. If you have grown up having this traditional staple at your holiday meal, then look no further. 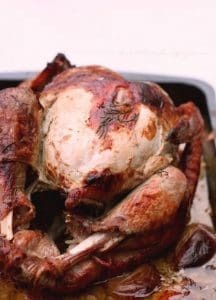 This juicy turkey recipe delivers on taste and time! It is simple to make, and the gravy is the perfect combo of tangy, herby, and sweet (thanks to the apples that you use in the roasted turkey recipe). Click here to try this recipe by Mellissa at I Breathe I’m Hungry! No Thanksgiving meal would be complete without cranberry sauce. 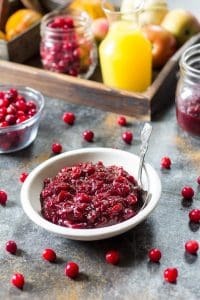 Traditional cranberry sauce recipes call for a high amount of white sugar, but this healthier paleo version is free from all refined sugar and high in antioxidants and vitamin C.
This recipe is simple and makes a delicious sauce that can be served fresh or stored for another meal. It also makes a great kid-friendly dipping sauce for meatballs, roasted chicken, or any other meals where a tasty dip may be required. Lets face it…not everyone loves pumpkin. While pumpkin pie may be the traditional dessert of choice at most Thanksgiving dinners, it is always nice to have an alternative for guests who aren’t fans. 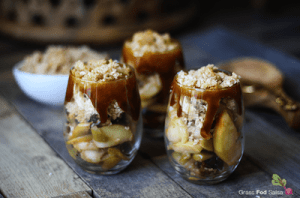 These salted caramel apple parfaits are easy to make, and look very enticing when you pre-portion them into small glasses or mason jars. The best part of all, is that they are nut free, gluten free, dairy free, and suitable for those following an autoimmune paleo diet. Click here to try this recipe by Anne Marie at Grass Fed Salsa! 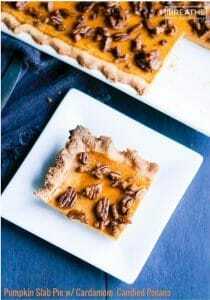 Low carb, pumpkin, slab pie, cardamom, and candied pecans. I can just stop there. But I won’t, because this recipe deserves a whole post of its own! Pumpkin pie is one of those desserts that you usually end up making at least two of (in order to feed everyone and so that you have enough for a midnight snack). A slab pie means you only have to make ONE pie! Applause! I adore cardamom. It is one of my favourite spices and imparts so much flavour and depth to recipes! It also happens to be my favourite essential oil. Coupled with the candied pecans, this duo makes the perfect topping for the perfect pumpkin pie. Did I mention the shortbread crust? I love a good upside down cake. They always look so pretty, and this upside down cake with cranberries is especially bright and colourful. The tender yellow cake pairs perfectly with the sweet and tart cranberries. This delightful recipe definitely delivers on both plate appeal and taste! 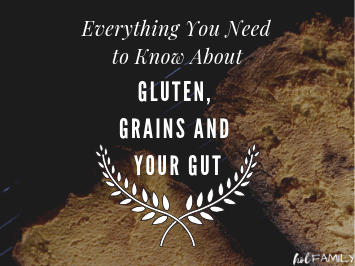 The best part is that it is low carb, keto, paleo and trim healthy mama friendly! 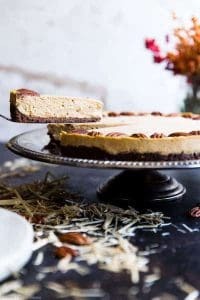 Last but certainly not least is this low carb keto pumpkin cheesecake. This melt in your mouth cheesecake is creamy, spicy, and sweet all at the same time! The gluten free graham cracker crust makes a beautifully dark contrast to the white cheesecake. Sweetened with healthy monk fruit, this low carb, keto dessert is another great alternative to pumpkin pie. Gluten free, grain free, and sugar free, you’ll be shocked by the amazing taste and the fact that it is only 240 calories per slice! Are you looking for more great healthy recipe ideas for easy meal planning, weight loss, and delicious meals the whole family will love? We were in the same boat….stuck in the same old rut of boring meals, last minute planning, and no idea how to get ourselves back on track. Thankfully, we discovered the PaleoHacks Cookbook! 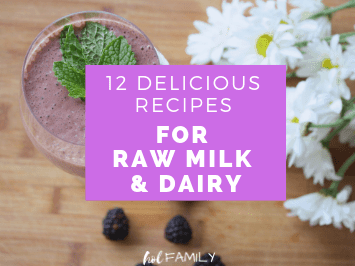 We already loved the PaleoHacks recipes and blog, and now we had access to over 125 healthy and delicious grain-free, dairy-free, and paleo recipes. Our mealtime woes vanished! 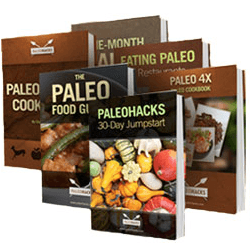 The PaleoHacks Cookbook fully-digital bundle consists of delicious recipes + 5 manuals: a 30 day meal plan, an eating at restaurants guide, a paleo food guide, a 4-ingredient cookbook, and a 30 day ‘quick start’ guide. Honestly, the value here is MASSIVE! If you’d like to get your hands on this amazing bundle today, click here and start enjoying these delicious recipes as soon as tonight! Your family will thank you! Go here to get your awesome paleo cookbook today. Amazing recipes! Can’t wait to try them!